Honda Germany has launched a special edition of the CBR600F which honors the German rider Stefan Bradl, 2011 Moto2 world champion and rookie of the year in the MotoGP World Championship 2012. 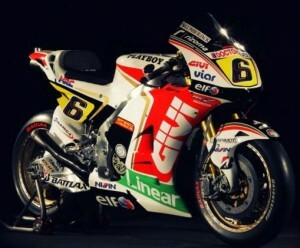 The 2011 Moto2 World Champion, Stefan Bradl, has its own bike. This year was 8th in the final standings of the MotoGP world by what the German importer of Honda has launched a limited edition of the CBR600F decorated with the colors of the LCR team of Lucio Cecchinello. Thus, the Japanese sport-tourism is cylinder capacity comes up radicalized a little more. In addition to the eye-catching aesthetics, the main differences with the moto serial pass through the adoption of a few fists Progrip, silent Arrow “Street Thunder” of titanium. This unit is equipped with ABS and combined braking standard. Introduced in 2011, the fifth generation CBR builds on the naked CB600F (Hornet) duly converted to his new role sport-tourism. The LCR Edition maintains the 102 hp and 211 kg standard. According to Stefan himself: “This bike is manufactured by true enthusiasts and 2 wheels with LCR design are fantastic. I enjoyed shooting with it and I’m sure this toy will be fun for their owners. It’s nice to know that many bikers will roll with the colors of my team and my career back: it is an honor for me! I thank Honda Germany support for this great idea!”.